I haven’t yet had a chance to check out the new Gentle Gourmet cafe/bistro in the Bastille, but from what I’m hearing it is truly not to be missed. Particularly because…they have vegan breakfast croissants! From the same team that brought us the (now closed) b&b of the same name, Gentle Gourmet opened in May serving a 100% vegan combination of French and Mediterranean food. The dishes vary with the seasons and are full of organic ingredients. Open from 7:00 am to 11:00 pm, they serve breakfast, lunch, dinner and even ‘le goûter.’ They also have a deli where you can pick up food for a quick picnic. Our friends at VG-zone were impressed by the restaurant’s “elegance” which they say outdoes the general Parisian veg scene. 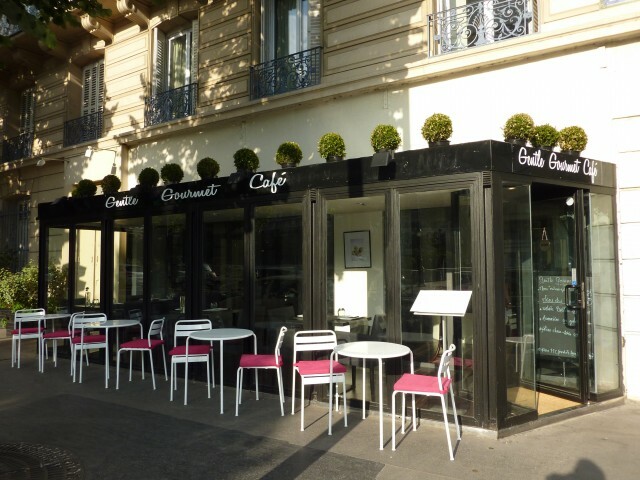 Prices are in the mid-range: entrées 9€, main courses between 12 and 16€ and desserts from 8€. My husband and I are just back from Paris, and our wonderful dinner at the Gentle Gourmet was one of the highlights of our trip. The ambiance is very chic yet unpretentious, the service professional and friendly, and above all the food was wonderful. It was a pleasure just to read the menu and know I could order anything-just wish we had found it sooner so I could have tried more items. The melon soup garnished with an edible flower was lovely, fresh and flavorful. My husband and I mentioned we were sharing our entrees and they thoughtfully prepared our dishes to make them easy to share by preparing two small polenta cutlets instead of the usual one, and by slicing the Southern white bean burger in half for us. The vegetables were cooked to perfection, and everything seasoned perfectly. What a wonderful way to end our Paris holiday. Que du bonheur ! Chaque plat est préparé dans les cuisines du restaurant avec des ingrédients frais (un luxe quand tant d’établissements proposent du sous-vide). Les plats sont créatifs, recherchés et bons, du début à la fin. Les boissons sont non-alcoolisées, on peut apporter sa propre bouteille de vin si on le souhaite. La déco est élégante et l’équipe attentionnée et discrète. Nous somme restées longtemps après les autres clients, on nous a laissé tranquillement discuter et prendre notre temps, en nous apportant non pas l’addition pour que nous partions mais une nouvelle carafe d’eau ! Je recommende sans hésitation. Excellent rapport qualité-prix. Gentle Gourmet is fantastic! I’ve eaten there twice and have yet to be disappointed. What I think is great is that the owner, Caroline, told me a lot of people are walking in not realizing it’s vegan but still love the food and leave with a different appreciation for veggies! PLUS, Caroline is also very pro-kale and all about using it when she can get her hands on it. Her family is even growing it in Normandy for restaurant use. To Jammes: We are very sorry that your experience at the Gentle Gourmet disappointed you. On our website or our facebook page, we always explain the way we serve the brunch ( buffet or “à l’assiette”). A classic brunch in Paris is two hours and often we let people stay 3 or 4 hours because they do feel comfortable at the restaurant and like to hang out. Our restaurant is heated but with 20 meters of glass window and France not used to very low temperature, it can be a little chilly when we opened this winter but we usually warm it up with vegan home made quality food. Please feel free to come back and we’ll talk about it. Contacting us directly would have been ideal.